The First Solution Should Be To Reduce The Government Spending Increases Since 2007 That Created The Debt Ceiling Problem In The First Place. I don’t see any gains by focusing on who got us in this deficit mess instead of what it takes to get us out of it. However, it is worth dispelling a lot of the media hype with the facts. It is time we all recognize that both political parties are big spenders and ruining our future to avoid making the right decisions “on their watch” to improve their chances of getting re-elected. The Democrats have been in control of spending bills since 2006 when they took control of the House and the Senate. So they “own” the spending since 2007 even more than the President that approved the budgets. I fault Bush for not vetoing them and for pushing adding the expense of Medicare Part D drugs for seniors; even though I am on Medicare. I fault Obama for adding another $trillion in debt to pass Obamacare over the objections of 70% of Americans, and willingly kicking the can down the road as he wages class warfare to take the attention off of his budget proposals and real solutions he does not want to face before the 2012 election. As you can see in the following table created by the Federal OMB, the last budget surplus was $160 billion in 2001. In 2010 alone there was a budget deficit of $1,400 billion, but a drop in revenue of only $370 billion from the 2001 or 2005 total revenues. That makes it easy to see that government spending has increased $1 trillion ($1,000 billion) a year and it was not due to the Iraq war started in 2003 or primarily President Bush, but was done by both parties. The OMB graph shows that Obama did not recommend anything in his budgets to stop this problem either—except to propose raising taxes $1,500 billion a year. We have reached the point where it is ridiculous to defend anyone in any Party, no matter how popular, that is adding to the problem instead of fixing it. These graphs also make it easy to see that the major problem is increased government spending, rather than the loss of revenues from the current recession. 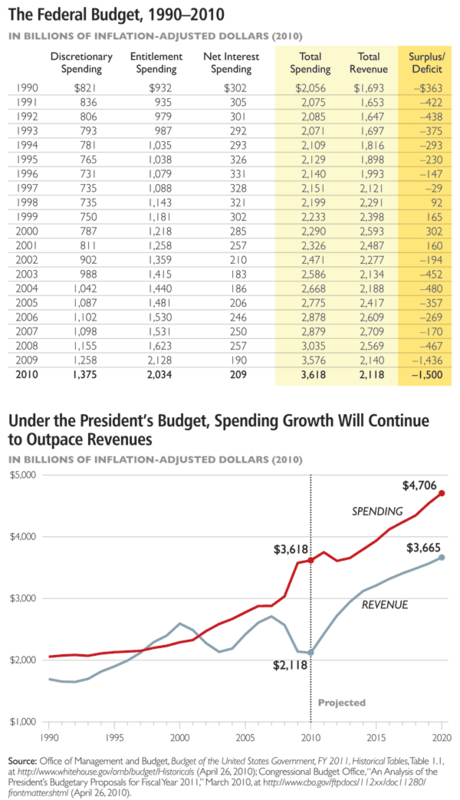 In fact, the graph strongly suggests that the first real goal of Congress and our President should be to get back to 2007 government spending and 2007 revenue levels as fast as possible. Instead, they added a $trillion in new future spending for Obamacare on top of the current Medicare and Social Security problems. It is also important to note that if all Americans including the very rich were taxed 100% of their income, we still could not balance the budget at the current level of spending. It doesn’t take a Financial PhD or rocket scientist to understand that the real problem is excessive spending not taxes being too low AND that we got into this problem by trusting the “professional politicians” that Obama recently said citizens should continue to leave the decisions to and stop bothering them with our ignorance. Let’s look at the $600 billion annual tax revenue loss first. Do you think it is due to something other than being a direct result of 11 million more tax paying Americans being out of work and small and large business cut backs to survive the current economic crisis and unknown future? We already went through this before with President Carter. But almost all of the TARP, Stimulus, and Quantitative Easing spending went to support the mortgage and banking industries here and overseas, especially the banks that created the housing collapse in the first place, and union pensions with things like the government GM takeover. No one in Congress or the President is talking seriously about how to help put Americans back to work faster with real government programs for US companies. As a small business owner myself, I can assure you it is virtually impossible to get a loan to grow my business today. Most of us suspected that the so called “shovel ready” jobs were another convenient empty promise to get more spending approved, and most of us have not been shocked to learn that the jobs the government did create cost taxpayers an average of over $275,000 a year each—and the highest new employment has been in the Federal government. Some of us even noticed that the big winner in the “Cash for Clunkers” program was China, who got all the scrap metal at pennies on the dollar while thousands of old cars were taken off the market to force more of us to buy new fuel efficient cars at higher prices. President Carter proved that raising taxes lowered federal tax income; not increased it. Presidents Kennedy, Reagan, Clinton and Bush proved that lowering taxes raised federal income; not lowered it. So why is President Obama refusing to discuss anything unless Congress first agrees to raise taxes? He keeps saying it is only on the rich, but $1.5 trillion a year will have to come from all of us and the House is refusing to buy into this scam again like they did on the $38 billion in spending cuts that ended up only being about $340 million in real life. And who believes that the housing/mortgage crisis was the cause of 11 million Americans losing their jobs? I suggest we do not believe anything Congress, the President, or the media says about fixing anything until they publish a detailed plan on how they intend to put 11 million people back to work—before they raise our taxes. A brief comment on the cost of the wars effect on our budget deficit—Yes the facts show we should save about $300 billion a year by bringing most of our troops home and we should do this ASAP. No more withdrawal timing based on political maneuvering for the 2012 elections. Per the Federal Office of Management and Budget, the military spending adjusted for inflation was $418 billion in 1993, $398 billion in 2002, $555 billion in 2007, and $692 billion in 2010. So both Democrats and Republicans approved these expenditures and the major increases came after President Bush was out of office. Just one more reason “blaming Bush” is a ruse and getting sickening to hear instead of some real solutions from both Parties today. Personally, I think it is pretty dumb to forget that Russia fought in Afghanistan for 10 years, almost spent their country into bankruptcy, and lost. You can not nation build rocks and caves and nomad tribes, and it does not take 175,000 boots on the ground anymore to eliminate terrorists. 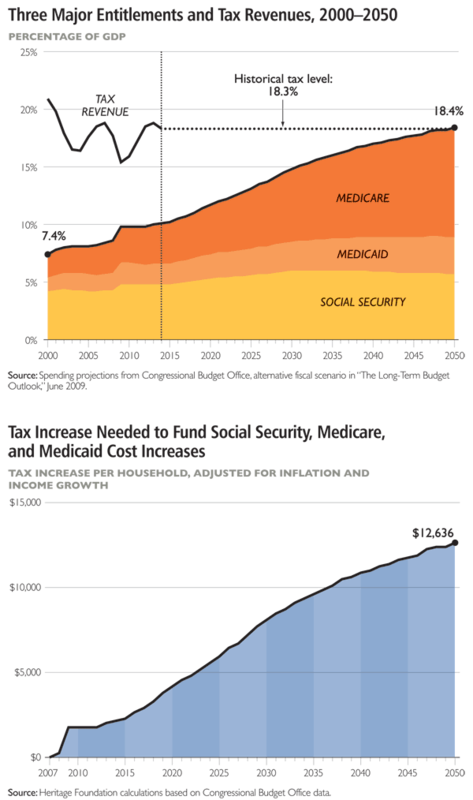 The published Federal financial numbers clearly show that anyone who says they will not touch Medicare or Social Security to fix the growing deficit is simply lying to get re-elected—or using clever wording implying they will do nothing, but not directly stating it. We are okay until about 2016, but it may be too late to start then. And let’s remember, these funds are in trouble primarily because Congress and past Presidents spent the FICA and Medicare income on other things so the money is missing as more baby boomer seniors like me retire. Not only do most current politicians support huge debt increases our children will have to pay, they want to cover up the money they effectively “stole” from seniors who paid into the system for 50 to 60 years. Almost any professional financial planner will tell you that if I had put the same money into an IRA or mutual fund that earned money, I would be “rich” today—and a good solution for fixing Social Security is to provide this option for anyone under 55 today. Here are some hard facts from the Congressional Budget Office data that make it crystal clear the real problem is insisting on continuing to do what we have been doing instead of doing something new, AND that current politicians know the real disaster comes after 2020 and after their retirement from office. It is simply dumb to plan on raising taxes $8,000 a year on every American household, rather than fix the problem. And we all understand that new business taxes get passed on to us too in higher prices. According to polls, about 65% also understand that higher taxes urge the very rich to invest their money overseas so they pay no US taxes like GE did on $4 Billion in 2010 overseas profits. Meanwhile, there are several reports that show just eliminating the known fraud in Social Security and Medicare would solve the problem for another 10 to 20 years. So why do we hear nothing about this crack down from our elected politicians and mostly how social security checks may be cut off unless we let them do whatever they choose without accountability? We need a lot less scare tactics and hype from politicians and a lot more straight talk and action now—not after they are re-elected in 2012. Remember, all of them have had access to the Federal OMB numbers above for years that you are probably seeing for the first time. It is vital that voters know the reality and better understand why the 2012 elections are critical to the immediate quality of life for all middle class and senior Americans and our children and grandchildren’s future. I urge you to do a little more research on your own to find out the facts so you have faith in them like I have done. We have to stop this being a popularity contest, racist, or class warfare issue and get back to running the country like responsible adults used to do. Bottom Line— It is time to stop re-electing anyone who refused to talk the truth openly with us now because it might cost them votes in 2012.